Making Instruments with Children ~ Easy, and safe for small children under supervision with an adult. Beginners Homemade Instruments ~ 6-10-year-old kids who can use sharp tools. Easy tuning. Intermediate Home Made Instruments ~ Children between 10-14. Sharp tools, Tuning skills. Low cost. Advanced Homemade Musical Instruments ~ Complicated designs. Costlier materials. Tricky tuning. Utilities to help you Make Your Own Instruments ~ Fret placement. Inventing instruments. Little children can make these with a little adult supervision. Scissors needed for cutting. Some gluing. Tuning unnecessary or minimal. Here are some musical instruments you can make with your child from everyday items: Plastic Egg Shakers, Paper Mache Fruit Shakers, Jingle Sticks, African Tambourine, Sand Blocks, Juice Can Shakers, Jingle Bracelets, and Quilting Hoop Drum. Very simple musical instruments little children can make and play. Children 6-10 will find these easy to make. Scissors or box cutting knife or glue gun may be needed. Tuning not difficult. I’m not sure that these artistic electric guitars can really play music, but they are fun to look at. You will learn how musical instruments vibrate in a series of fractions called the harmonic series, and how to design your own musical instruments by measuring length, liquid volume, and weight/mass. Make your own musical instruments with your children with these fun easy to make ideas! Building pan pipes is a fun way for students to apply their knowledge of measurement and length. As they will hear: longer tubes produce a lower pitch, and shorter tubes produce a higher pitch. Make a banjo, bass, a dancing lumberjack, dulcimer, drum, rainstick, or a thumb piano. What dinner party is complete without a song from the Wine Glass Symphony? You’ll need a few wine glasses, some water, and a tune in mind to demonstrate the sounds of science. Amaze everyone and display incredibly bad manners all at once. People of all ages love the razzy, jazzy Kazoo sounds that come from this fun-to-make and easy-to-play musical instrument. Vibration is the key to making sounds and this harmonica uses a rubber band trapped between tongue depressors (Jumbo craft sticks). If you don’t have the supplies, RAFT has the kit for a low price for 1 or 10 harmonicas. Start by getting five 20-ounce Sobe juice bottles. Fill each bottle with the amounts of water shown above using U.S. fluid ounces or milliliters. Mark your bottles carefully at the water level with a permanent marker. Number your bottles 1, 2, 3, 5 & 6 and arrange them in the order above — 1 on your left and 6 on your right. Gently tap the middle of the bottle with a metal spoon. Tip: go to the grocery store with a metal spoon and test the small bottles you find there. Buy the ones that sound good, and are in a flavor you’ll enjoy drinking. 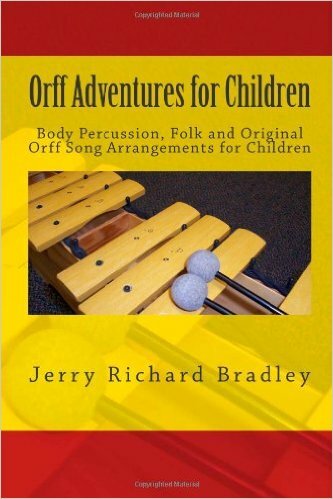 This is a book of Orff Music Lessons, activities, body percussion and Orff Instrument arrangements. It’s a full six weeks or more of musical lessons as each lesson will take multiple days to teach effectively. These lessons have been kid tested and approved by an Orff Certified instructor, currently engaged in teaching elementary music students. Duet for Zipper and Velcro. Sonata for Milk Carton Guitar. Kitchen Concerto. Every home and classroom is crammed with objects kids can use to make music. 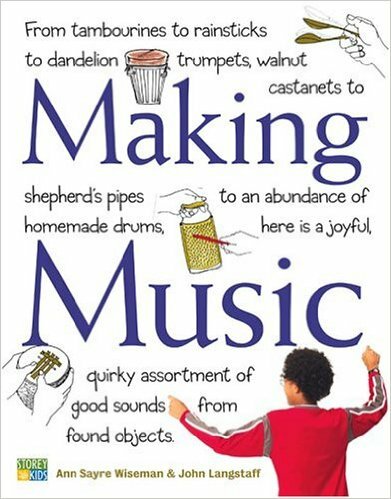 This book teaches kids, parents, and teachers how to see musical possibilities in everything from a crumpled sheet of paper to thimbles glued to the fingertips of a glove .Two of the most respected names in arts education for children have teamed up to produce Making Music. With her imaginative projects and whimsical drawings, Ann Sayre Wiseman shows kids how to make rhythm, string, wind, and keyboard instruments from all kinds of household items and natural materials.